Mexican wedding cookies. Of all the requests people had for gluten-free holiday cookies, I think this was the most requested. Finely ground nuts, butter and shortening, gluten-free flours, and powdered sugar. It isn't much more complicated than that. All that deliciousness and it's easy too? Sign me up. Still, it's Mexican wedding cookies that call my name. I love the idea of a wedding celebrated with these float-on-air, light and lovely, sweet-but-not-too-much-so cookies. And if it's a wedding, there have to be a few nuts, too. 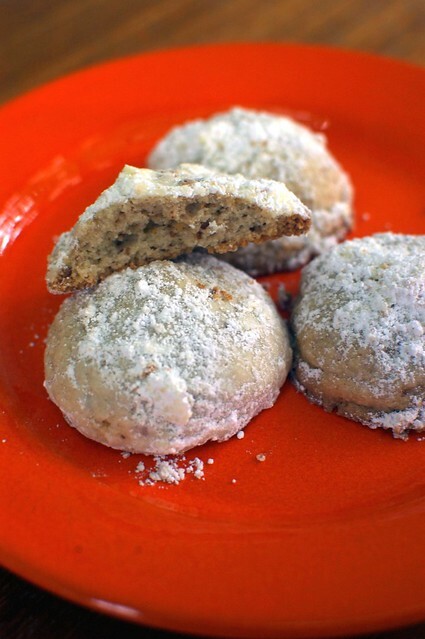 There are a hundred dozen recipes for Mexican wedding cookies out there, including one on the back of the powdered sugar bag. However, if you're making a delicacy of Mexico, why not go to someone who knows the foods of Mexico with her heart? Pati Jinich is a wonder. I know here from Twitter (of course), where she dispenses recipes, cooking ideas, and funny stories about her boys. Raised in Mexico in a family filled with people passionate about food, she became a political analyst in the United States, with a master's degree from Georgetown. However, she kept gravitating back to food, around the edges of her intellectual job. (Hm, this sounds familiar to me.) Urged by her husband, she leapt. She's now the chef and cooking instructor at the Mexican Cultural Institute in Washington D.C.
One of my goals for 2011 is to finally meet her. Look at the food on her website, Pati's Mexican Table, and you'll want to be her friend as well. Last week, she told me she was working on her recipe for Mexican wedding cakes. I waited, patiently. And then I made these. The real name of these is polvorones, and according to Pati, they are available at nearly every bakery and grocery store in Mexico. "Mexican wedding cakes" is the American version. Still, that's how we know them here, so I'm calling them that so you can find them. But let's say it together, shall we? Polvorones. Or, in other words: a super-flaky cookie that almost disappears as soon as it hits the tongue, lightly sweet with powdered sugar and air pockets that seem impossible in something gluten-free. You'll be hard pressed to eat just one. These cookies are meant to be a celebration. Go ahead and have another. Preparing to bake. Preheat the oven to 350°. Line a baking sheet with parchment paper or a Silpat. Put the pecans in a food processor (or mortar and pestle, if you want to be authentic) and whirl them up until they are ground fine. Add the powdered sugar and pulse the food processor until the pecans and sugar are combined. Set aside. Cutting the fats into the flour. Put the flour, xanthan gum, guar gum, and salt in a large mixing bowl. Add the chunks of cold butter and vegetable shortening and begin working them into the flour immediately, quickly. We used a pastry cutter, but you could easily use your hands. Work the fats into the flour until you have a coarse, crumbly dough. Finishing the dough. Add the pecan and sugar mixture to the dough. Work it in with your hands. Crack the egg into the bowl and combine everything together, thoroughly, using your hands. (And be sure to work quickly. You don't want that butter and shortening to warm up too much.) Work the dough until it comes together as one ball of dough. Baking the cookies. Make a ball of dough about 1-inch wide. Pat down the dough ball just a bit with your fingertips. Leaving about 1 inch of space between all the dough balls, fill the cookie sheet. Slide the baking sheet into the oven and bake the cookies until they have a golden-brown color, about 12 to 15 minutes. Pull the baking sheet out of the oven and immediately dust the cookies with powdered sugar. Allow them to cool for 10 minutes, then carefully transfer them to a cooling rack. Eat when there is not a hint of warmth to the cookies. drool... hey, i thought you were done posting for the holidays! Bless you Shauna! These are going to be my Chinese New Year cookies - I only wish my grandpa was still here to taste them (he looooved the soft, melt-in-mouth peanut cookies we got for him every Chinese New Year). May your Christmas be wonderful, blessed, restful, and everything you could want. Thank you for giving so generously! DROOLING! love mexican wedding cookies...they totally scream Christmas to me! My absolute #1 favorite cookies of all time. Yum. Thanks so much for the recipe! We don't keep guar gum in the house, so I'll be looking for my guar to xanthan conversion info in just a minute, but I wanted to ask why you've chosen to use them both? Do the different gums, like the different flours, have different properties which come into play? I like to play with recipes, though I'm not nearly as dedicated as you, and would really love to know! Wonderful. I've made gluten-free Mexican wedding cookies before. I remember they were very tasty! When we lived in Texas, it seemed to be divided into two camps: one who called them 'pecan sandies' and one who called them Mexican Wedding cookies (oops, I don't know if wedding is supposed to be capitalized, there) and so I can't decide, but considering I'm half Mexican I should go with that. Since we also avoid casein now, I will have to try these with ghee. Thank you! Merry Christmas to you and your adorable family! These are my favorite cookies ever! I love these for Valentines day. My sweet gets to have these soon. Thank you! Thank you! OK to use something other than Aherns' all-purpose gluten-free flour mix? These look amazing and I would never guess by appearance they are gluten free! I just found your site and absolutely love your recipes. Your "about me" is very touching and appreciate your sharing so much of your life. I will definitely be checking on your site often! Happiest holidays to you and the Chef! I just made a version of these this week with local roasted organic chestnuts and I was looking for a way to change it up for a friend that eats gluten free! Thank you so much for this recipe! I'm going to make them today with browned butter & chestnuts and take them to her! I made these yesterday and they are great. Mexican Wedding cookies were one of my favorite 'regular' cookies and now I can have them again. Since I was in a bit of a hurry, I made the entire dough in the food processor and it worked great. I'm surprised that the xantham and guar gums are necessary. I would think that you could just replace the wheat flour with a nut flour, and it would work fine. Perhaps it's because there's egg in the dough - my family's recipe for Russian Tea Cakes has no egg, no leaveners, just butter, sugar, nuts, flour, flavorings. I'm also surprised that you're able to get a good cookie using half vegetable shortening. My sister tried making them with margarine last year, and they just fell apart. What she saved in buying margarine instead of butter, she lost when she had to go buy MORE nuts plus the butter. These look delicious!!! My grandmother first introduced me to these cookies, and ever since they have been one of my faves. Without the powdered sugar, they would still be OK, but with the sugar they are 1000 times better. Thank for sharing this! These are always my favorite go too cookie for the holidays. This year we made them away from home and I forgot the zanthum gum at home. Those cookies didn't survive the powdered sugaring but did make a nice crumble for the top of my apple crisp. My second time around was after the trip to the store for the missing ingredient. I used the same cookie dough to make the Mexican wedding cookies as well as jam thumb-print cookies.